If you are the kinda person who lugs around a notebook everywhere you go trying to jot down notes or remembering things to do, then you should probably try out this new app for Android. It’s Microsoft Office’s One Note app. One Note has been around since 2010 and is part of the Office suite. The app for Android allows you to create notes with text, pictures, and bullets. Make and manage to-do lists with checkboxes. Then keep your notes in sync using free Microsoft SkyDrive online storage to access, edit and manage them from virtually anywhere, from your PC or almost any web browser. Access your notes online at www.skydrive.com. ▪ Must have Android 2.3 or higher. ▪ A free Windows Live ID is required to use OneNote Mobile for Android – use an existing ID or let OneNote help you sign up. ▪ Web functionality uses the free OneNote Web App available on SkyDrive, which requires a supported web browser. 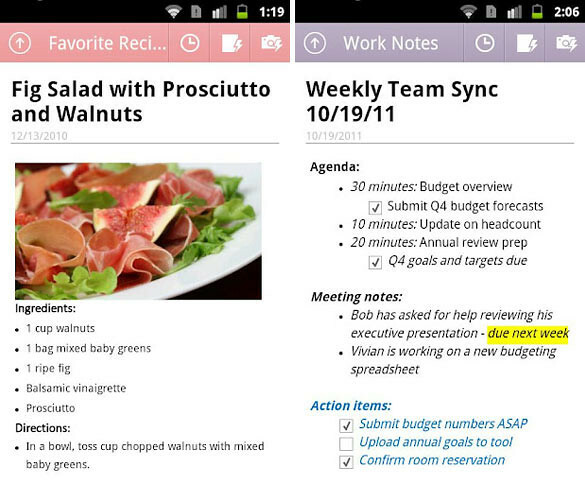 ▪ OneNote Mobile for Android opens notebooks created in Microsoft OneNote 2010 or the OneNote Web App. Check out this One Note intro video for Android.